The allamanda (Allamanda cathartica), also called the golden trumpet, yellow bell and angel's trumpet, is a broadleaf, evergreen shrub native to South and Central America. Winter hardy in USDA zones 10 and 11, this seasonal bloomer features showy yellow flowers with white marks on the throat. Mature shrubs range from 10 to 20 feet in height with 3- to 6-foot spreads. Allamanda plants grow rapidly and need the occasional pruning to maintain optimal attractiveness and health. Allamanda shrubs need occasional pruning. 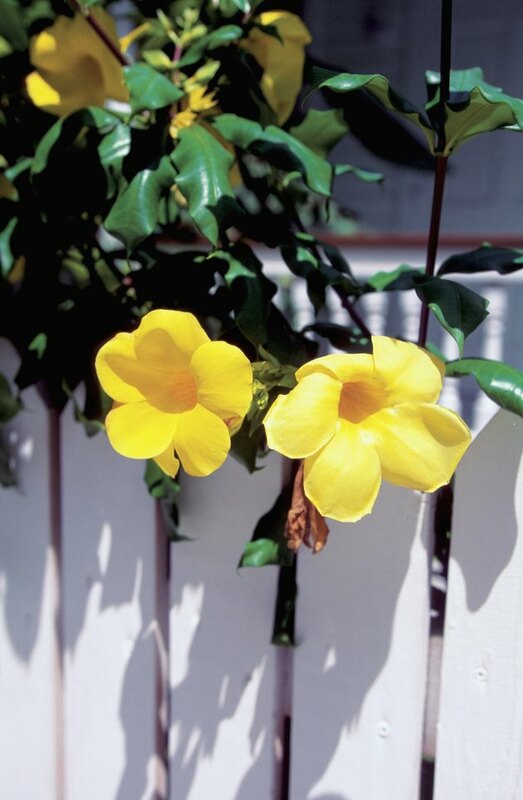 Prune your allamanda shrubs in the late winter or early spring before the new growth appears. Use small, hand-held pruning shears to trim just the ends of the branches. This promotes the growth of new buds and shoots. Prune your allamanda shrub down to the desired height. The U.S. Forest Service explains that these shrubs grow quite quickly. Without proper pruning, allamandas rapidly become overgrown and look bulky. Cut out all damaged, dead or dying branches. Prune out any stems that rub against or cross another stem. This will help prevent injuries that can allow pathogens to enter the plant tissue. Prune out the interior section of your shrub. Thinning out your allamanda promotes healthy air ventilation that can help prevent fungal diseases such as leaf spot from attacking the foliage. Cut out the oldest, woodiest branches first since they don't enhance the beauty or form of your shrub. Prune allamanda shrubs about once a month throughout the growing season to keep them looking tidy. Prune lightly, however, because a hard pruning can result in few new flowers and very dense foliage. Check your shrub for insect infestations during the monthly pruning. The Missouri Botanical Garden reports that allamandas often attract mealy bugs and scale. Prune out any affected plant tissue.